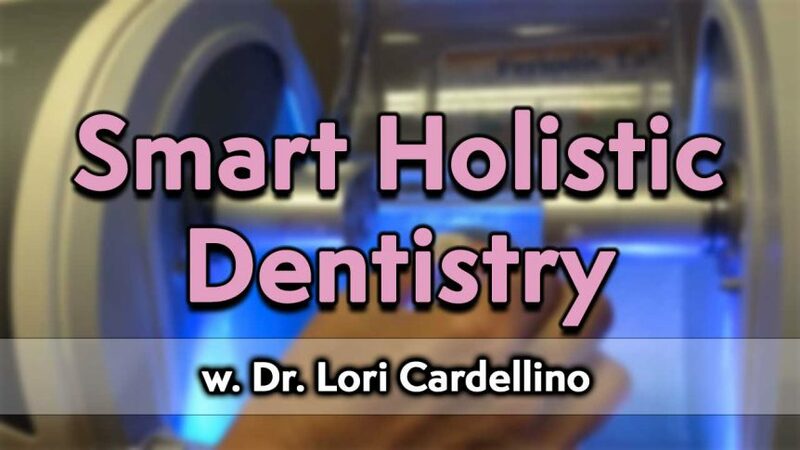 Smart Holistic Dentistry with Dr. Lori Cardellino – Taking care of your teeth, gums and tongue is an excellent way to keep your immune system working properly. Smart Holistic Dentistry with Dr. Lori Cardellino is a three part course. Part 1 is a very important and informative lecture/interview about the truth of “Holistic Bio-Dentistry vs Regular Dentistry” to get you started in your Terrain Modification program. The mouth, teeth, tongue and gums must be detoxified in order to get healthy, wealthy and happy again. Dr. Robert Cassar and Mark Daniells interviews Dr. Lori Cardellino about this very confusing topic about optimal compatible green dentistry. Many people do not realize that their mouth is a real live time bomb for sickness and toxicity. In this interview we will be talking about many areas of dentistry and how to negotiate a toxic mouth into one that is significantly less or nil (problems/reactions/simple solutions). Part 2 – Fixing my broken tooth without any toxic anesthesia, sedatives or pain medication. This is a first time experiment for the both of us. The experiment is to fix my cracked tooth without any anesthesia, and see if it is possible without caving in to the possibly intolerable pain. I cracked off the corner of my back left molar, and the tooth was exposed and very sensitive to touch, cold, hot or any stimulation at all. Using various “mind over matter” skills can help you achieve it not using any numbing solutions. This is the second time Dr. Cardellino and I did some deep dental work without any anesthesia. The dentist must be a very skilled dentist like Dr. Cardellino is as you will see. Part 3 is an important interview on taking care of your Teeth, Gums and Tongue. This is of course an excellent way to keep your immune system working properly. Most people have seen the dentist on many occasions previously, and have had many toxic mercury fillings or other toxic filling replacements, 1 or more root canals, wisdom teeth removed, dental metal or porcelain/aluminum/nickle crowns/bridges, fake gold teeth, implants, false teeth, stainless steel braces etc. So, before you spend literally thousands of dollars thinking you are fixing or repairing your teeth and gums – make sure you do some research on the correct materials and procedures that you would like to have implanted into your mouth. These ideas and concepts are very confusing and disturbing for most simple or normal people, who are malformed from the professions that only know what they have been taught at school. These consistent daily dental assaults can be very hard with the infection or constant exposure to heavy metals being swallowed or breathed into the body. This is one of the major culprits in many peoples weakening of the bodies immune system due to the mouth being very toxic. I had all of my toxic mercury fillings changed over 15 years ago to bio-compatible materials. I also replaced my unknown super toxic aluminum, porcelain and nickel based crown to a cubic zircon total complete material crown too. “Scientific evidence has established beyond any doubt two propositions: 1) Amalgam fillings releases mercury in significant quantities, creating measurable exposures in people with fillings, and 2) Chronic minimal exposure to mercury in the quantity released by the amalgam fillings increases the risk of physiological or biological/mental harm. Dentists who engage in elective replacement of amalgam fillings have been criticized by their peers for unnecessarily exposing their patients to additional mercury during the process of grinding the old fillings out. Yet, the “mercury-free” dentists are the ones who are most aware of the problem. Please make sure you do your homework before getting regular dentistry versus holistic dentistry. The mouth is one of the largest and constant assaults of the body and mind I see on a daily basis. Other Recommended Courses: Heal Your Mouth, Teeth and Gums from Pain and Disease and Protecting, Detoxing and Cleaning The Tongue and Gums. Our immune systems can only take so much constant low level 24 hour a day poisoning from the mouth. Remember, there are so many pollutants and assaults in the world that we all live in. Once we get a constant low level accumulation, then the overload of constant chemicals, poisons or biological assaults to our immune system starts to falter, or short circuit, and won’t function optimally any longer. Is there any wonder why there are so many immune deficiency diseases going on in the USA and Canada and the entire so called civilized world as well? Earther Academy is our private hub for the deeper layers of “Terrain Modification” protocols, practices and principles. The Academy is always in a constant work in progress both personally and collectively. Terrain Modification is always in a state of optimizing, enhancing and upgrading the information, concepts, disciplines and practices. Dr. Cardellino is the best dentist I have gone to as far as really being careful, delicate but firm and skilled at the same time. There is noting worse that going to the dentist and getting a host of different pain medications for the procedures before and after the visit. Terrain Modification practices, principles and protocols are a must to live healthier in this super toxic world that is very easy to navigate to cleaner and smarter lifestyle. Sound information is not easy to find for sure, so be careful with what is begin spewed to you by the mainstream media or many of the so called “authorities”. So, you can see a 25 year old silver/amalgam/mercury filling smoking off toxic mercury vapors that are known poisons. This unknown toxic mouth phenomenon is happening to most of us. Paul has been to the dentist and have these types of known controversial toxins. People at risk are having these types of toxic or controversial materials used in amalgam, silver or mercury lead and tin based fillings,toxic root canals, toxic crowns, bridges etc. unknowingly and silently poisoning ourselves and our precious families daily.